I love having outside space. I missed it so much in all those years of apartment living. A major redo of the yard is in the future, when we build a deck and become all fancy. 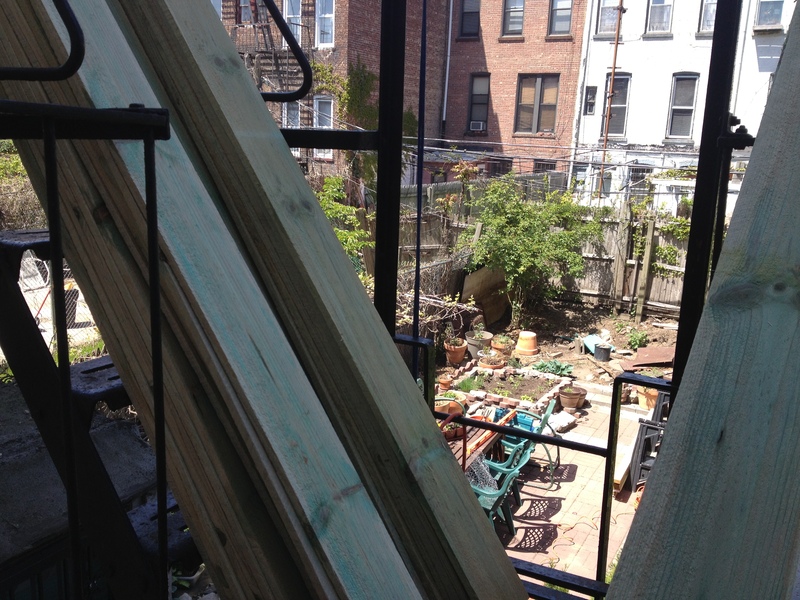 In the mean time the space is as utilitarian as the fire escape ladder we use to get to it. Every year I like to plant a tomato plant. Or two. Or five. Trouble is, most of Brooklyn has soil contamination issues stemming from the borough’s industrial past. 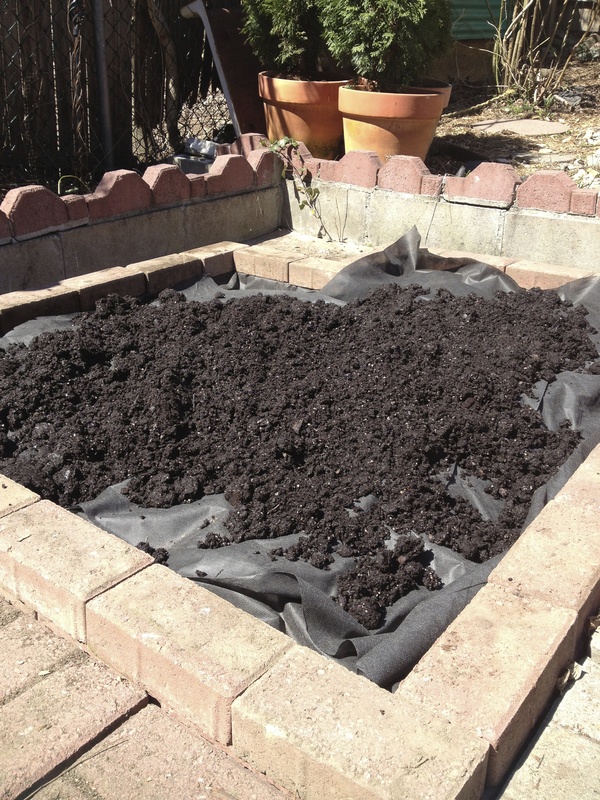 After having our soil tested and finding out that there were some substances in it we’d rather not eat, the solution was to create a raised bed, and fill it with fresh non-contaminated soil. Because everything about our back yard is temporary, it really didn’t make sense to spend a lot of money, so we used stuff we already had – a surplus of paving bricks. 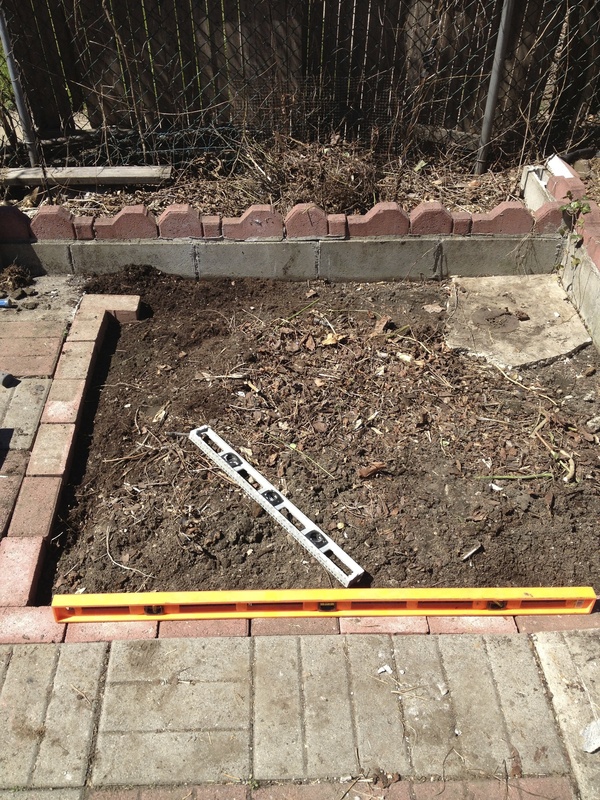 With a level, a trowel and a whole bunch of pavers, I made a box of sorts. 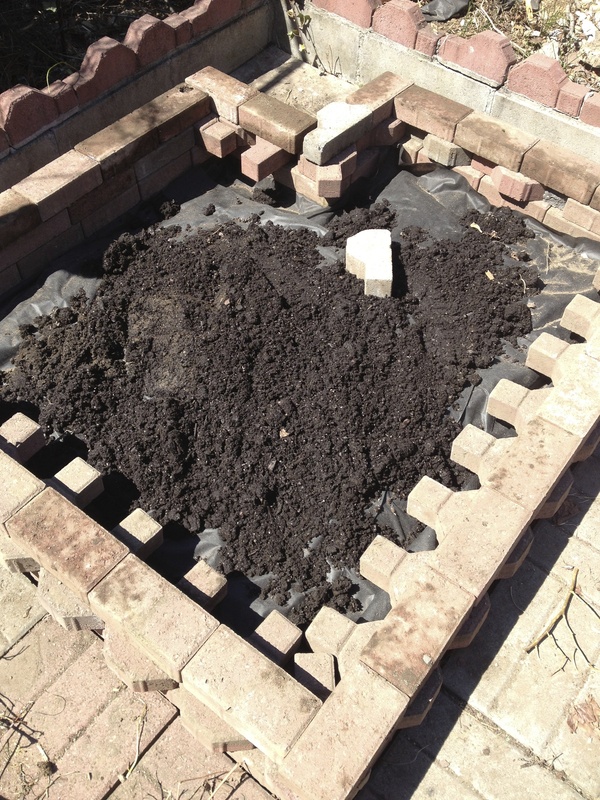 I then lined the bottom with landscaping fabric and filled with the clean soil – all 15 cubic yards of it, carried through our parlor floor and down the fire escape. Landscaping fabric helps keep the new soil separated from the old. 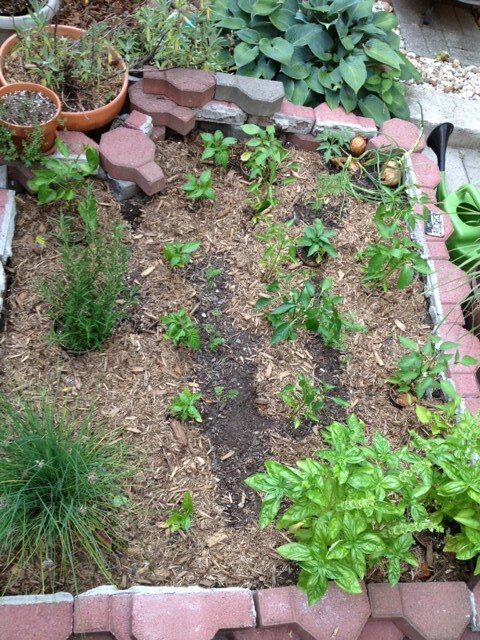 Came out pretty well, if I do say so myself… Now we wait for the Dahlias to bloom. Wow! We would love to have our backyard look something like this! How long did take and about how much would something like this cost? This is absolutely gorgeous! Aw, thanks! It’s a temporary fix to hold us over until I can put together the English garden of my dreams, sometime in the distant future. 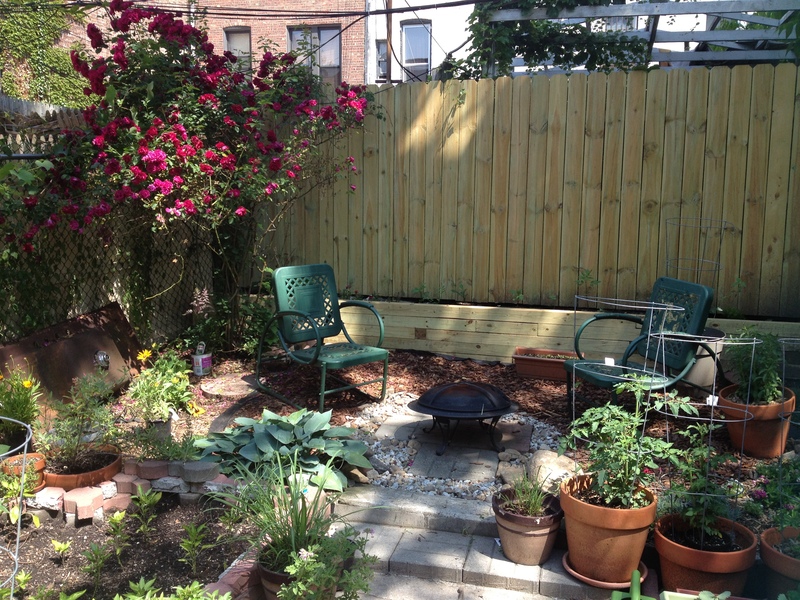 This is our second summer at the house, and this year’s backyard looks totally different from what it was last year. A lot of the materials were there already and just got re-arranged. The pebbles under the fire pit have been dug out from the flower beds (there are pebbles everywhere – anytime I go to plant something I dig up a bucket full of rocks, so I needed to find a use for them). 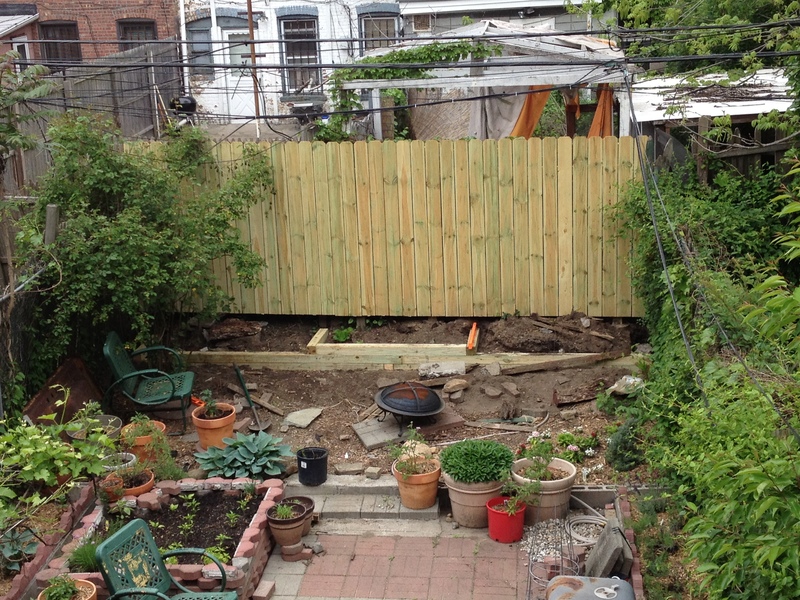 The fence and retaining wall materials probably cost about $300. The next most expensive thing was landscaping fabric – the weeds are crazy and the fabric helps to keep them at bay. The fire pit was bought on clearance at Target, the chairs were free. Other than that, it’s plants and mulch. Lots and lots of mulch. If you decide to plant vegetables, I strongly recommend you have your soil tested for led and other heavy metals. Brooklyn’s soil is notoriously contaminated. Brooklyn College offers very inexpensive testing.